A little over a month ago, my good friend and colleague, Mark Petrovic, had an idea for a project/service. That idea evolved into taglets.org, which we introduced today. At first, to be honest, it was not obvious to me how it would be used or by whom. But Mark is smart and I trust him. So that was enough for me. It was also a perfect opportunity to get some hands-on experience with the Google App Engine platform. The service is first a platform, with a reference implementation layered over it via the www.taglets.org web site, with the platform defined by a public API that developers can use to create and manage users, tags, and comments. While it may look at first glance that this is a twitter clone of some kind, the fact is, Taglets is not intended to replace anything else. It’s fundamentally different. For marketing people, that spells disaster; but in this case, that’s fine, because many of the best ideas never had a business plan, target market, or clear demand. If you ask “what problem does this solve” the answer will be, “you tell us.” It’s open and flexible, and like many things before it, we have no idea how Taglets.org might get used, ultimately. The followers of a tag are anonymous. A tag is the target (to-address) of a message (comment) but unlike Twitter et al, that tag is not necessarily associated with a particular recipient/person/entity. Think of this like the street number on a house. Anybody outside that house can learn that location’s address (tag) “123 cherry lane” by simply observing it and anyone can send a message to that “tag” by postal service. But that doesn’t mean they actually know who lives there or, in other words, who they are sending to. One can learn the address of the house, it’s “tag”, simply by driving by. They can’t learn who lives in the house by name, yet they can still send a message to that “tag” – the people inside the house determine who actually receives that message, without the sender being aware of how their message was ultimately distributed. The sender of a message (comment) is anonymous. The sender may elect to include a “return address” or sender identification of some kind within the content of the message, but there is no “from-address” associated with a comment. Comments are transitory. There is no history (timeline). Comments posted to a tag are distributed to the followers of that tag (via email, Twitter DM, or HTTP POST) and discarded by Taglets. Tags can be searched. Comments cannot be. Obviously, if you receive Taglets.org notifications via Twitter DM, they are archived at Twitter, but they are not archived at Taglets.org itself. Tags are public. Anyone can search a tag, by name or description (keywords). Anyone can create a tag. Anyone can follow any tag. No follower knows who else follows the same tag. Tag names and descriptions are self-describing and have no formal meaning to Taglets.org. 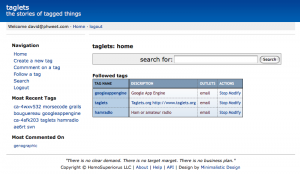 The creator of a tag describes what that tag refers to with a description field, but this is opaque to the taglets.org service itself (simple free-form text). Users will decide on the conventions they want to use in tag names and tag descriptions, similar to the way that twitter status messages can be overloaded with links, photos, hashtags, and @user constructs. Taglets.org allows a person to send a message to “something” even if that “something” is not yet tagged and has no recipients. They can simply create a tag for it and send a comment, even if it goes to nobody. A “tag” can be something as finite as, say, a device’s MAC ethernet address, or as abstract as an idea. It can be a person, a category, a blog name, a company, or a product. When you follow a tag, you can have updates delivered via email or Twitter account (Security note: Taglets.org never requires or stores your Twitter password). You can can also tell Taglets.org to POST to a specific web page when a comment arrives for the tag. This might be used for a WordPress hook, for instance, or to trigger some other action via PHP script, or similar.